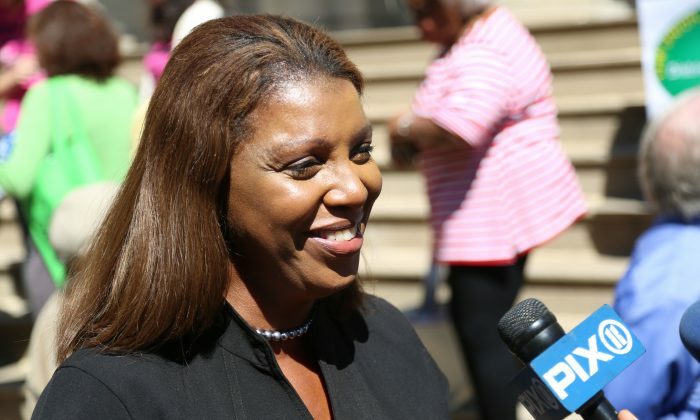 NEW YORK—On the heels of a massive explosion Wednesday’s that destroyed two buildings in East Harlem and killed at least 8 people, New York City’s Public Advocate Letitia James says the city needs to take a close look at the inner workings of the city. James thinks the city should revisit recommendations from a 2007 task force on infrastructure that she and fellow council member Daniel Garodnick headed up. The formation of the task force was spurred, in part, by a Con Edison water pipe that exploded just months earlier during evening rush hour near Grand Central station. One person was killed and more than 30 were injured by the explosion, which ripped apart the sidewalk near 41st St. and Lexington Ave. Those pipes dated back to 1924. That explosion and a subsequent heavy rain that led to flooding in the subway made it obvious there was a problem. “…[these incidents] made clear to all New Yorkers how dependent we are on aging, but crucial infrastructure,” stated the report. In 2010, the task force issued its four-fold set of recommendations. They included budgeting to maintain and expand the city’s infrastructure, planning for protections against flooding, harnessing green energy, and modernizing the waterfront infrastructure. James thinks those recommendations deserve a fresh look after the events of this week. “It’s time that we revisit those recommendations including, but not limited to, investing in hiring more inspectors [at the] Department of Buildings, and examining the conditions of our aging infrastructure,” said James. She added that the state’s Public Service Commission, which is obligated to ensure safe and reliable access to basic services including gas and water, should also take action. “The Public Service Commission needs to also make this a priority moving forward to avoid these major catastrophes in the future,” she said. The problem of New York City’s aging infrastructure and its potentially deadly effects are nothing new to city leaders, agencies and residents. In fact, there are repeated reminders that the U.S.’s largest metropolis is daily pushing the limits of what its infrastructure can handle. Just last month, a water main broke near Manhattan’s Union Square, flooding buildings and causing a massive sinkhole in the middle of a major intersection at 15th St. between 5th and 6th Aves. Nobody was injured, but once again pipes from 19th-century water pipes were to blame. In 2014 alone, other water pipes have had fairly major bursts at several locations throughout the city, including at 103rd St. between Riverside Park Drive and West End St., on Greenwich St. between Leroy and Clarkson Sts., and on Roosevelt Island. As for the Harlem explosion, James said there could be some liability issues if reports that residents were complaining of gas for days beforehand turn out to be true. Con Edison has said they have only one report on record. For now, though, she is deferring to City Council Speaker Melissa Mark-Viverito.